Manufacturing plants and industrial processes that standardise with ISC2 seals could benefit from less inventory and greater flexibility. Designed to meet the dimensional standard ISO 21049 (to fit ISO 3069 seal chambers), the ICS2 cartridge mechanical seal can be used to replace inferior seals that are installed into differing pump & mixer models. Single ISC2 seals have capable throttle bushings to protect against leaks. 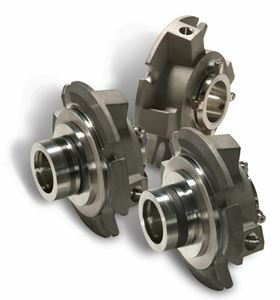 Pressurized double seals provide zero process emissions. The outboard seal of the Flowserve ICS2 double seals can handle full operating conditions if the inboard seal were to fail. All seal faces are dual balanced for normal and reverse pressure operation. ISC2 seals work hard to eliminate the possible causes of failure & leakage: Robust seal face drive mechanisms, highly efficiency barrier (re)circulation, and high quality materials all contribute to the improved seal life associated with this seal. Moreover, with multiple operating conditions, and frequent starts/stops, this seal offers resilience. Thermal management, and fluid presence, technology can also be employed in which to further protect against dry running.